It was Easter and the kids were home so I thought I'd give my work on my other projects a break and do something else. I knocked this up for fun and learned some important lessons about using custom subclasses of NSView and internationalization at the same time. It took me about a week to go from idea to version 1.0.0, including some tricksy debugging and designing all the graphics for the game. I'm sure I couldn't have done this as quickly using anything other than Apple's Cocoa IDE. JewelToy now uses OpenGL to power its graphics. This means that it will no longer slow down if you're browsing the web and listening to iTunes while you're playing. Users with older machines will see a marked increase in playability. 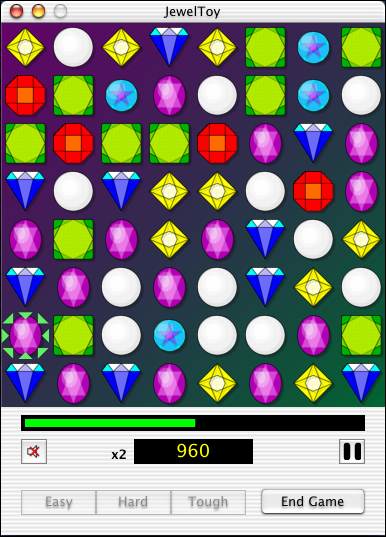 Now as well as using your own pictures as gems for JewelToy, you can set the backdrop for the game to any image on your hard drive. Simply check the 'Use custom backgrounds from folder:' box, and click the 'Select Folder' button to choose the folder from which to draw the background graphics. All seven gems can now appear in the random starting pattern. Option added for custom background graphics from a selected folder. The Mute/Un-mute button gets more representative graphics. Added French and Japanese localizations, thanks to Peter and MIZU. (the international localizations still trail behind in terms of features and will be updated in later versions). Game graphics switched entirely to OpenGL for efficiency and speed - you can now play JewelToy and listen to iTunes, even on an older system. Fixed bug where High scores were not being saved. Added Eric Cherry's original alternate graphics to the collection of alternate graphic files. Revised the scoring system, cascades now score significantly more (inspired by Mike Wessler). Allow import of custom gem graphics in preferences. Coloured background added to show off new gems (inspired by Mike Wessler). And, much requested, gems that would make a line hang about to taunt you for a second after time runs out. Score bubbles every time a row is made. Freeplay (untimed play) now lets you accumulate bonuses. Gems above a cleared line shiver before falling, and fall with small random delays. If you are having a problem with OpenGL then use original Quartz version. Internationalization is a work in progress, I really need some people to help with translations (French and Japanese would be particularly welcome at the moment, we're only English/German bilingual in this household). If you make a better job of producing any localized version and send it to me, I'll include it in the next release (the same goes for for any bugs you fix or features you add - no need to if you don't want to... it's all GPL'd! ).